The Portland District Corps of Engineers, intend to award a contract for Lower Columbia River Clamshell Dredging. 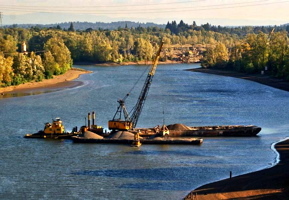 This dredging project includes maintenance dredging of two side channels along the Washington State side of the lower Columbia River at Baker Bay USA and Chinook Channel. Approximately 75,000 cubic yards will be dredged at Baker Bay. Approximately 50,000 cubic yards will be dredged at Chinook. A clamshell dredge will be required. Water Quality Monitoring will be required. Disposal of maintenance material will be in-water. Anticipated dredging start date is 15 September 2010 with an anticipated completion date of 31 October 2010. The magnitude of construction for this solicitation is between $1,000,000 and $5,000,000.